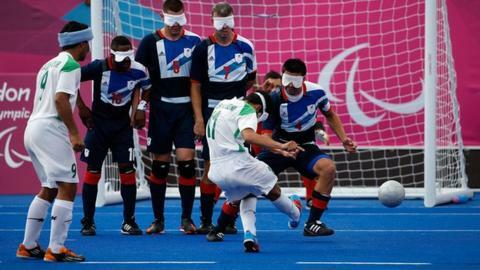 Great Britain's hopes of a Paralympic five-a-side football semi-final place drained away as a stubborn Iran side held on for a 1-0 win in the final Pool A match. The hosts needed to win by a two-goal margin to progress but never looked likely to amass such a scoreline. Their chances slimmed further after Ahmadreza Shah Hosseini Ardekani slotted home from eight yards. Sustained late pressure produced chances but Iran held firm. Argentina and Spain progress through to the final four to meet Pool B sides Brazil and France respectively in the semi-finals. Great Britain, who finished third at last year's European championships, will now play China to decide seventh place in their final match at London 2012. Iran had lost both their previous games in Pool A 2-0, but showed little sign of obliging the hosts with a similar defeat. Captain Hossein Rajab Pour forced Dan James into a sharp save from the best of the early openings before the British goalkeeper was called upon again to beat away a set-piece after Great Britain had accumulated three team fouls. The hosts' indiscipline proved their undoing as they slipped behind in the 21st minute. After racking up three team fouls in a half, each subsequent foul results in another penalty from eight yards out. Given a second chance off the spot after another British indiscretion, Ardekani drilled hard and low into the bottom left corner of James' goal to increase the task facing the hosts. Shortly after a foul on English in the D gave Clarke a chance to extend his fine goalscoring record and drag his side back to a scarcely-deserved parity. But his powerful effort was smothered by the Iran goalkeeper and as the second half progressed without a breakthrough Great Britain's fate grew increasingly clear. With 15 minutes remaining Great Britain increasingly threw caution to the wind but still they could not conjure the goal that could have been basecamp for a late assault on the Iran goal. English was denied from a pair of eight yard set-pieces by the crossbar and a smart save while Clarke's decent strikes on goal were competently dealt with by goalkeeper Meysam Shojaeiyan.